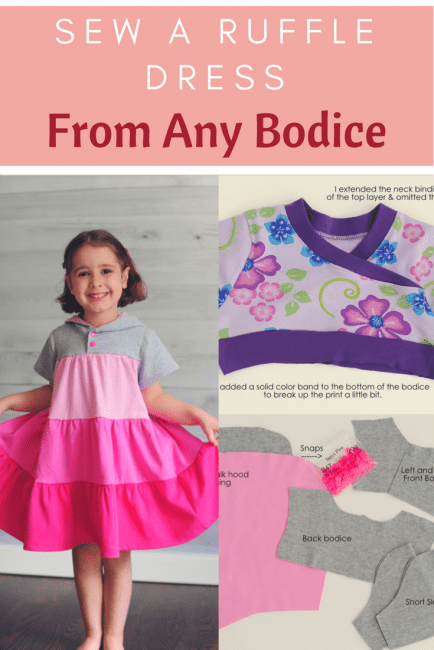 How to Sew a Tiered Ruffle Dress with Any Bodice - Peek-a-Boo Pages - Patterns, Fabric & More! Have a girly girl in your house? She will definitely go crazy over this tutorial! Rachel from handcrafted by RED is here today from the contributor team to teach us how to turn any bodice into a tiered ruffle dress. Hello cuteness overload!! And the twirl factor is AMAZING 🙂 I know my little lady is going to need a few of these for sure! Hi everyone! I’m so excited to be sharing my first tutorial with you today. 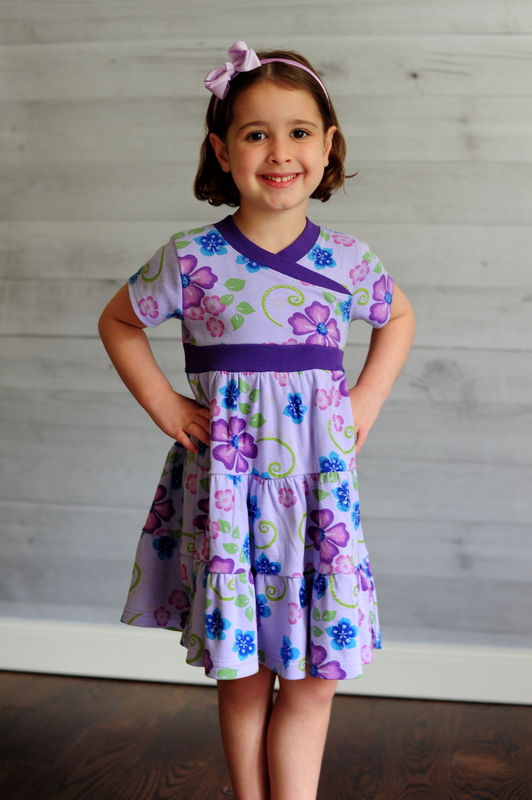 I’ve been wanting to sew up a tiered knit dress for a while now and as all of the new fall back-to-school catalogs have started arriving at our house I was reminded again that I still don’t have a pattern for one in my files. (I’m not the only one who studies and scrutinizes every inch of those catalogs for ideas, right?!) I decided that it shouldn’t be that hard to figure out all of the math and set to work. I’ve had a vision of a tiered rainbow dress since last summer, and have kept a little stack of brightly colored knits in rainbow order on my shelf since then, just waiting for the right opportunity. 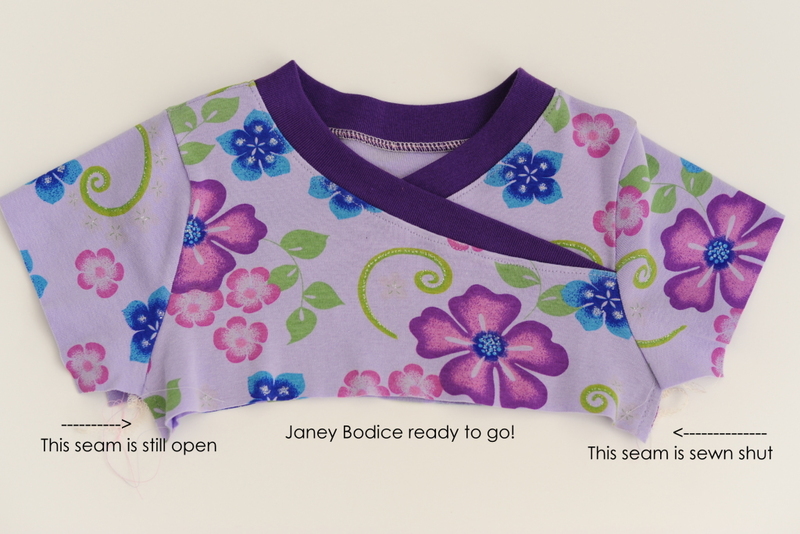 I decided to use the Rio Racerback pattern for my first version, and my daughter loved it. 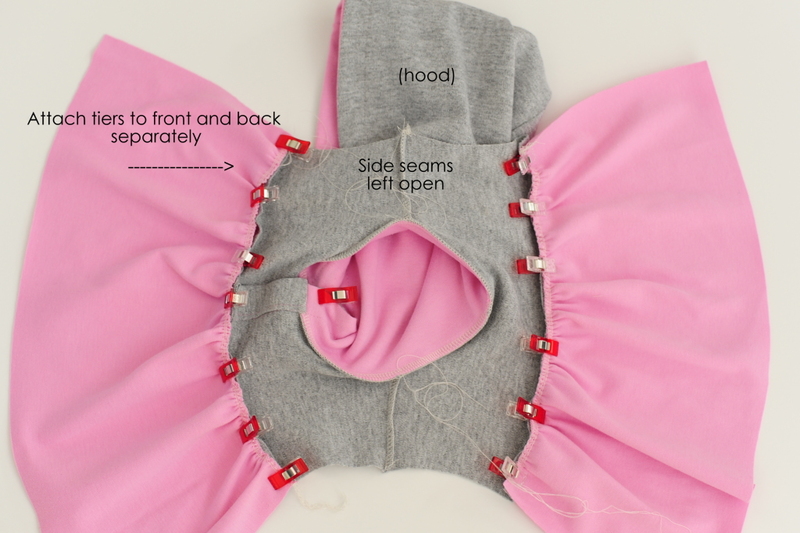 I do a fair amount of pattern modifications, but I always sew up one version that is true to the pattern so I can get a good feel for the instructions and also the fit. Because the tiers will add some weight to your finished dress, you may want to size down in whatever bodice you choose. 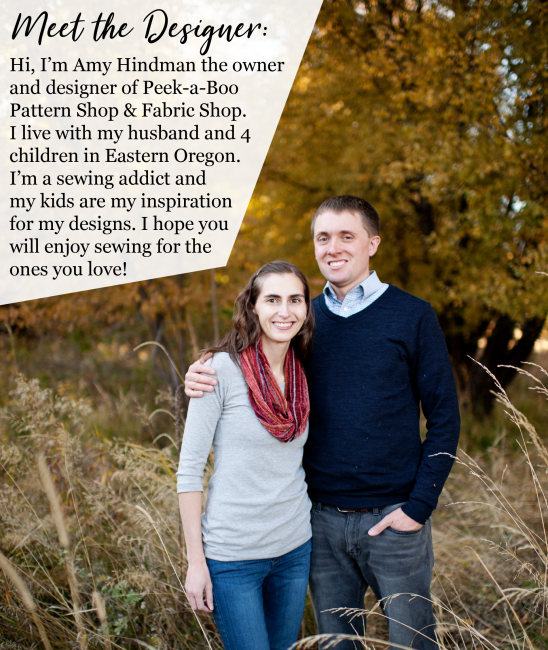 Amy’s patterns provide great basic blocks that are well fitting and can be easily adjusted to suit any number of variations. For this tutorial, I decided to move away from the Rio and start thinking more toward back-to-school, so I sewed up tiered versions of the Grand Slam, the Boardwalk Tee, and the (free!!) 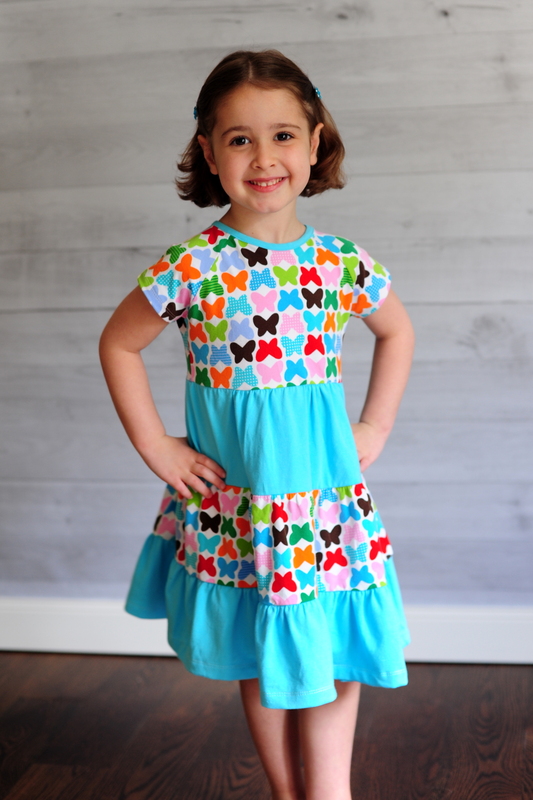 Janey Jump Around dress. You could even use a store-bought tee or tank if you wanted to – just decide where you’d like the tiered portion of the dress to start and cut the tee evenly across at that point (leave a little extra for seam allowance though!). There’s a bit of math you’ll need to do to calculate both the height and the width of your tiers. First, decide how long you want your finished dress to be, from shoulder to hem. You might want to keep this on the shorter side (mine are all just above the knee) again because of the added weight. Then, decide where you’d like your bodice to end and your tiers to begin. 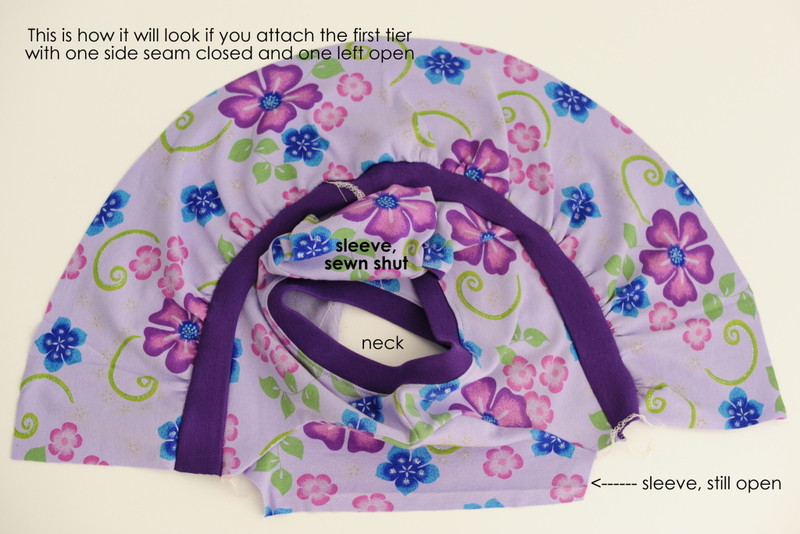 I have found that either just below the armpits (about 2-4″ works best for most patterns, but it will depend some on the size and proportions of the child) or just below the waist (for more of a tiered dropwaist skirt) are good places. Beginning the tiers too low on the chest might cause your bodice to pull down a bit, depending on the weight of your fabrics and how many tiers you opt to include. We’ll work with one of my dresses as an example. 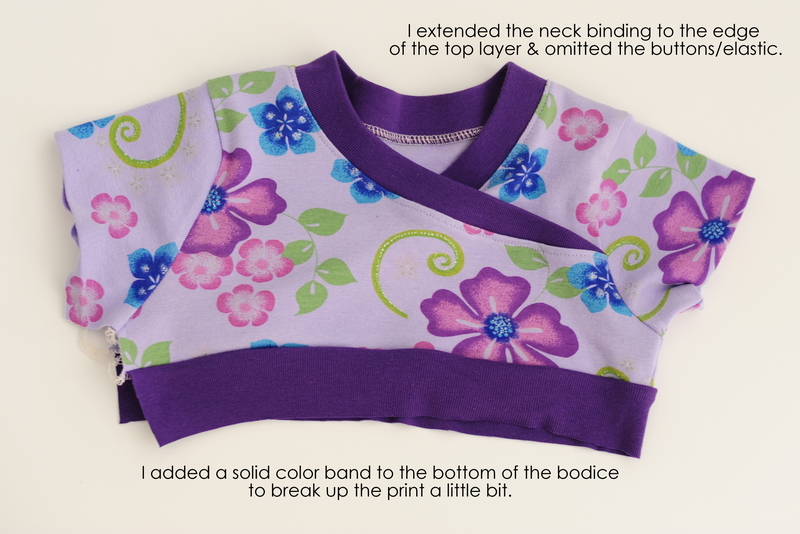 I wanted my finished dress to be 23″ long, and my bodice was only 5″ tall. Therefore, I will have 18″ for the tiered portion of my dress (23-5 = 18). 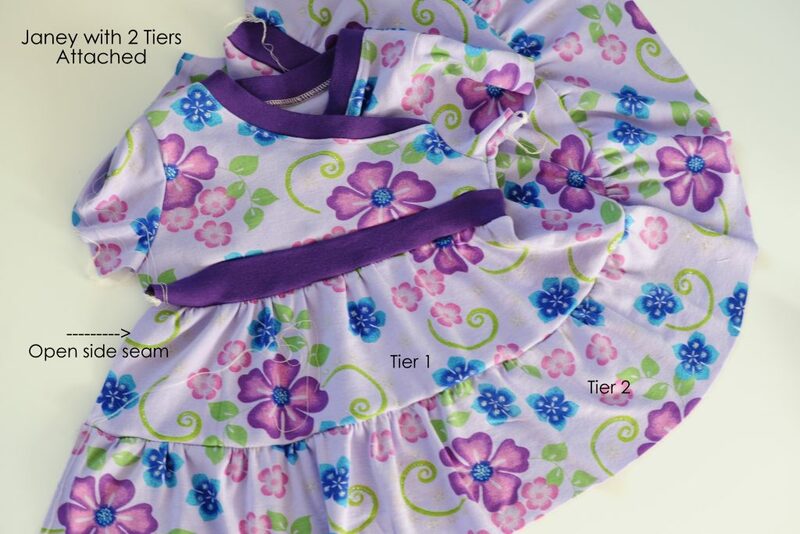 I’d like to have 3 tiers (that are all the same height) for this dress, so I’ll divide that 18″ by the number of tiers I’d like (3) and they will each be 6″ tall. Don’t forget your seam allowances! I add 1/4″ for the top and bottom of each tier since I’ll be attaching with my serger and not really trimming off any fabric, so I’ll add 1/2″ to the length (height) of each tier before I cut them out. In this example, I’ll cut tier 1 and tier 2 to be 6.5″ tall. I also need to add a hem allowance for tier 3, and I’ll add 1″ for that. 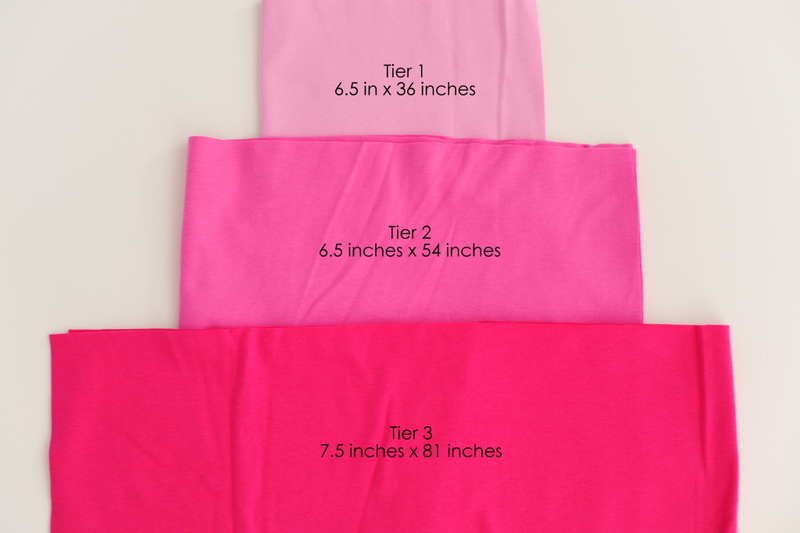 So tier 3 will be cut at 7.5″ (6″ + 1/2″ seam allowances + 1″ hem allowance) tall. Next we need to calculate the width of the tiers. Begin by measuring the width along the bottom of your bodice. I used a variety of bodices in a size 3 or 4 for these examples, and most of the bodice widths were around 24″ so we’ll use that number. Since you’re gathering the tiers to attach them to each other, these measurements don’t have to be super precise – it’s ok to round up or down a little instead of making yourself crazy to try to cut out a piece that is 36.875″ wide. 😉 You will need to decide how gathered you want the tiers to be, though, since that will determine your measurements. When gathering woven fabrics it is common to double the measurement for each subsequent tier, but for knits that is often a bit too heavy. I decided to calculate 1.5x the width of each preceding tier, since that still gave me a nice visible gather (and a very full, twirly dress) but wasn’t too heavy or bulky. 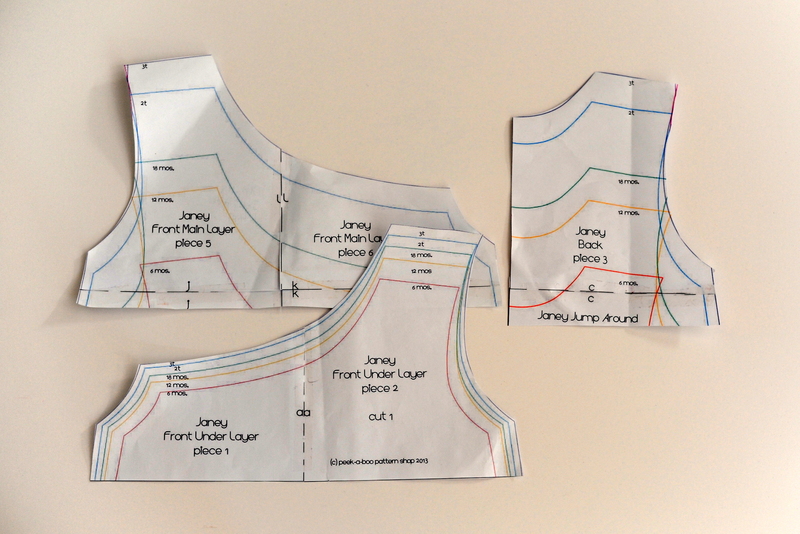 For our example, the bodice width is 24″ (remember if you’re measuring from the pattern piece that you’ll either need to multiply by 2 – for the front and the back – or by 4, if your pattern piece is to be cut on the fold). Since 24 x 1.5 = 36, our first tier will be 36″ wide. Calculate the measurements for the next two tiers, and you’ll be just about ready to go! 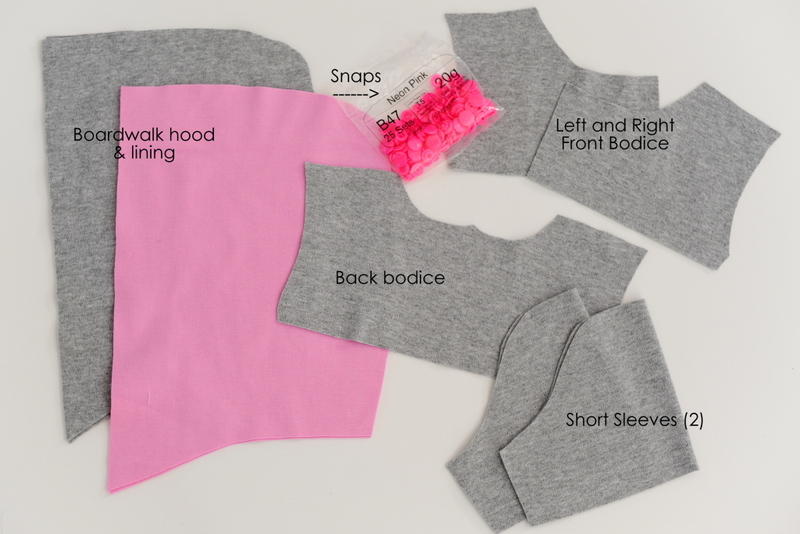 Now, cut out all of your fabrics – you should have your bodice front and back, sleeves if you’re including them, binding or neckband or hood depending on what bodice you’re using, and the strips for your tiers. 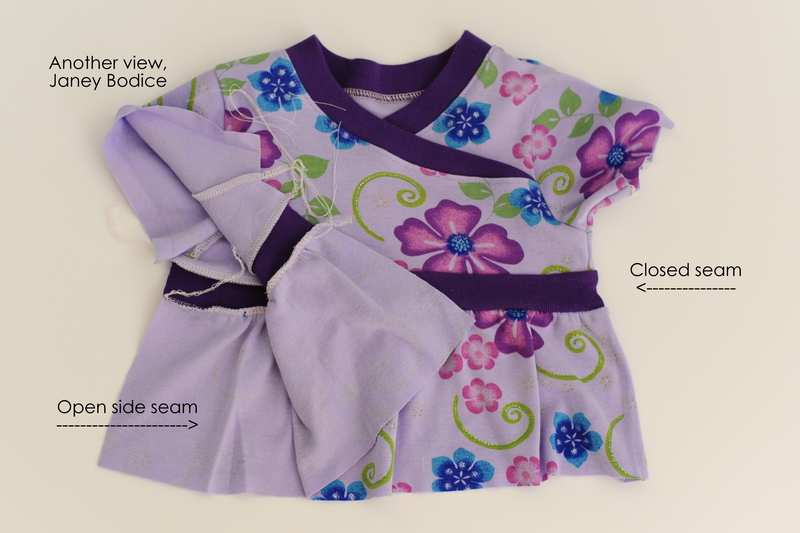 Make sure to pay attention to the grainline of the fabric, and cut your strips with the grain. Now it’s time to start gathering! (Side note: I really, really dislike gathering. Why I decided my first tutorial would involve so much of it is still a mystery to me. Six tiered dresses/tunics later, I’m beyond gathered out.) There are lots of different ways to gather, so use your preferred method here. I tried out a new (to me) method for this project and I really liked it. I used my serger with the stitch length cranked up as long as it could go (on my Brother 1034d, it’s a 4), serged along the top of each strip without cutting off anything, and then carefully pulled the two needle threads out – when I tugged on them, the fabric gathered nicely. This worked best with my knits that had a little lycra or spandex in them, since the thread really slid along the gathers nicely. Interlock was a little trickier, depending on the weight, and the baby rib knit I used worked ok but got stretched out easily so I needed to be a little more careful/gentle with the threads (not always my strong suit). Once you’ve got the first tier gathered to the width of the bodice, serge or sew them together. 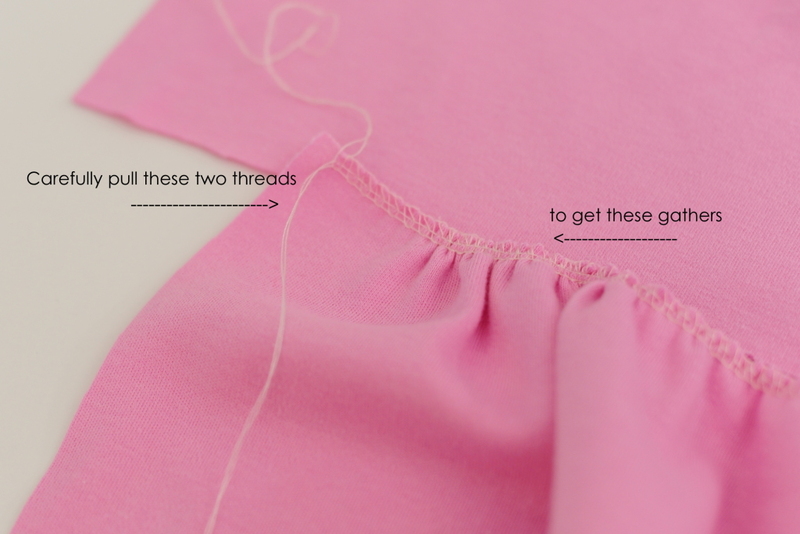 If you’re using a sewing machine for this step, make sure to use a zig zag or other stretch stitch. 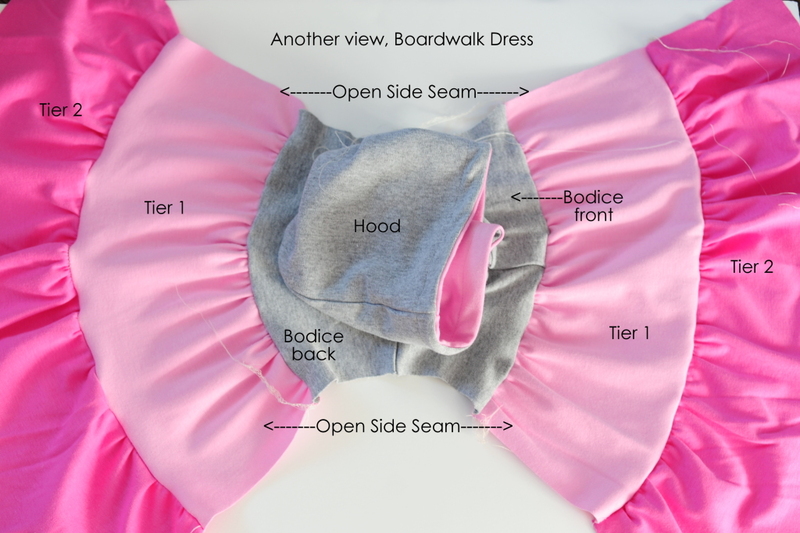 I showed you the Boardwalk bodice photo just before we started gathering since it showed how the tiers would be attached flat if you leave both side seams open. Here’s what it will look like if you’ve only left one side seam open. Continue with the second tier, gathering it to match the width of the bottom edge of the first tier, and sew those together too. Finish up with the rest of your tiers, and then take a deep breath and have some chocolate. Press the seams up and give those gathers a good shot of steam. Looking good! If you’ve attached the tiers in the round, then all you’ve got left to do is hem the bottom and you’re done. Yay! If you’re like me and you’ve left one or both side seams open, you’ve got a little work left to do. 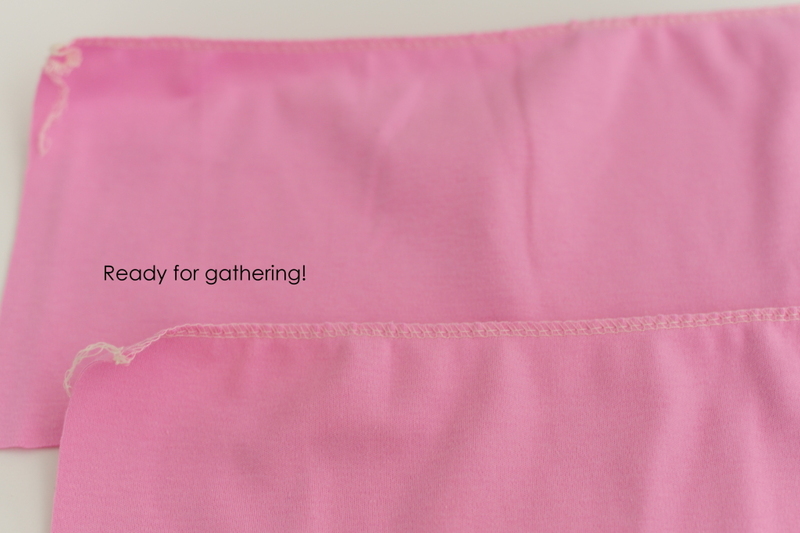 Carefully sew up the side seam(s), right sides together, taking care to line up the tiers. 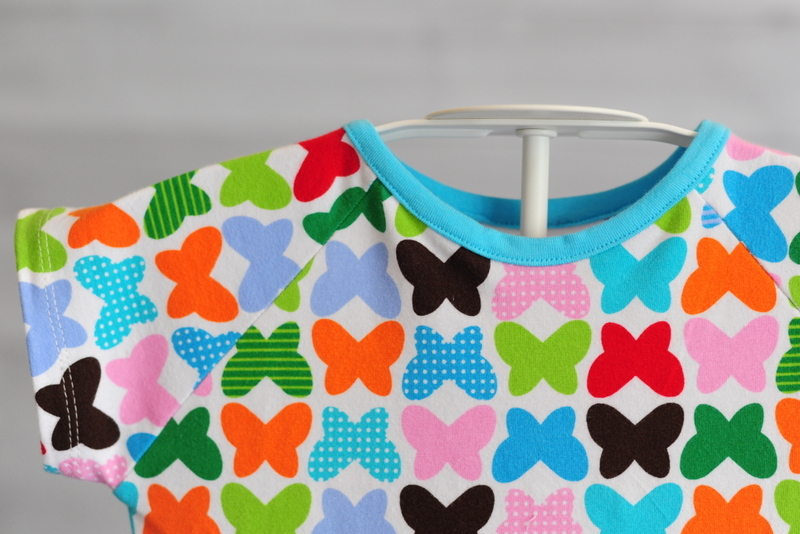 I like to butterfly my seams (so one is facing up and one is facing down) – that way when I serge down the side seam, they tend to stay in place a bit better and one doesn’t push the other one down and out of alignment. Once the side seams are sewn, press and steam again (this will really help give the dress a nice shape along the sides), and hem the bottom tier. 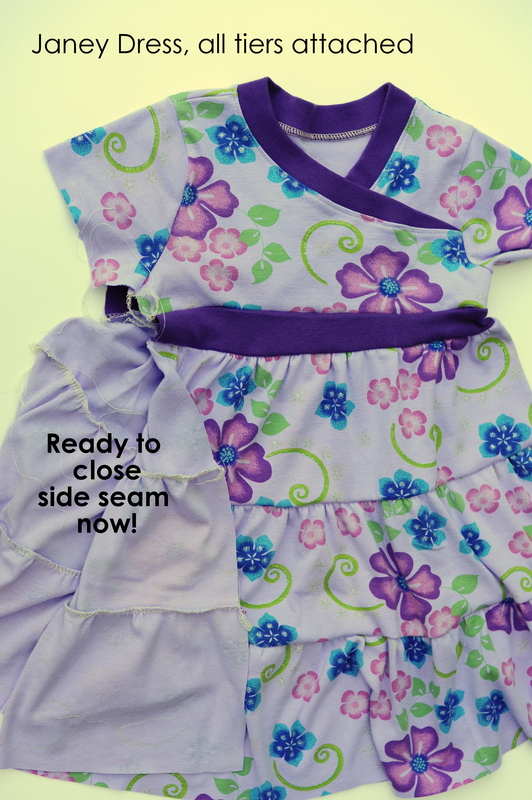 I find that pressing my hem up when the bottom tier is still flat can be helpful – I open it up to sew everything in place, but then I can just fold it back up along the pressed line when it’s time to hem. Easier to manage since there’s a lot of fabric to contend with at that point! 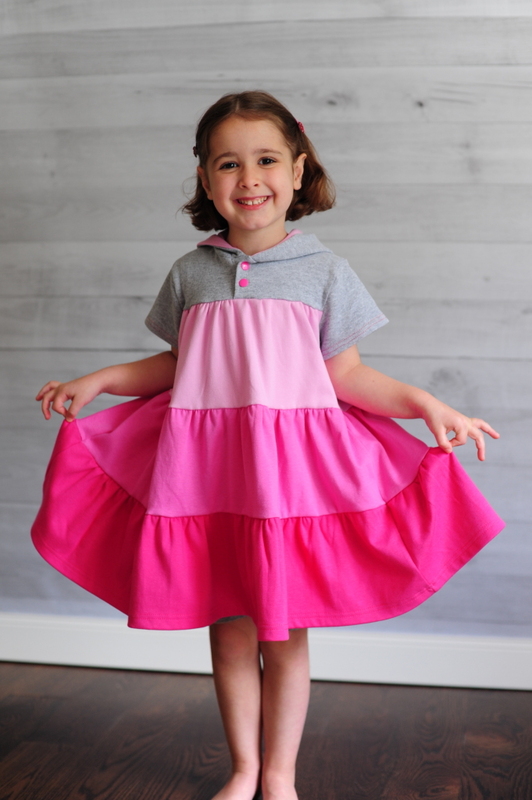 Find a little (or big) girl to try it on, and watch them twirl! Here are three other versions I sewed up, using the Grand Slam tee pattern. For these, I shortened the sleeves to be more like cap sleeves. This one was a gift for a friend’s daughter, size 2T. 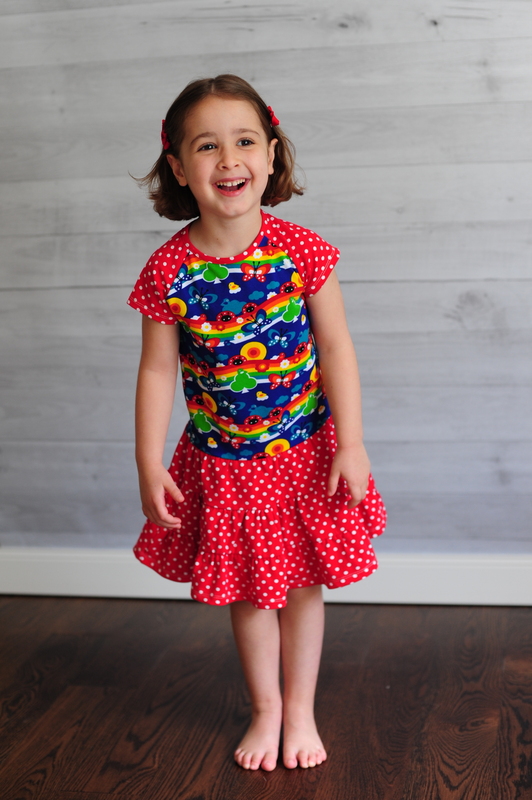 I used two tiers to make it more of a tunic length, and paired it with Lollipop Leggings in capri length. This one I decided to bind the neckline instead of doing the wider neckband. Amy’s got instructions for how to do this in her Rio Racerback pattern. Here’s a shot of the dress and a closeup of the neckline. Thanks for reading this far! Miss P loves all of her new dresses, and I’m ready for a little break from gathering all of those tiers! Next month I’ll be back with a tutorial for the boys. 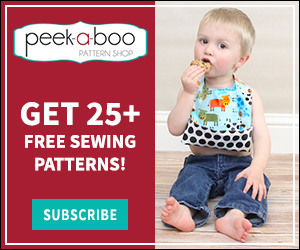 🙂 We’d all love to see what you come up with in the meantime – make sure to join the Peekaboo Patterns Facebook group if you haven’t already, and share your creations over there! WOW!!! you made SO many!! I love them all and Can’t wait to try soon!!! I really need to get that foot out and try it! I LOVE all of these! I need to get busy making some for my twirling loving girl! Sensational tutorial, Rachel! All of the dresses are fabulous, and your wonderful photos and detailed descriptions on how to achieve the look of each is outstanding. Thank you so much. Best tiered dress tutorial I have ever read.